Karlyne (right) on her final day of training! 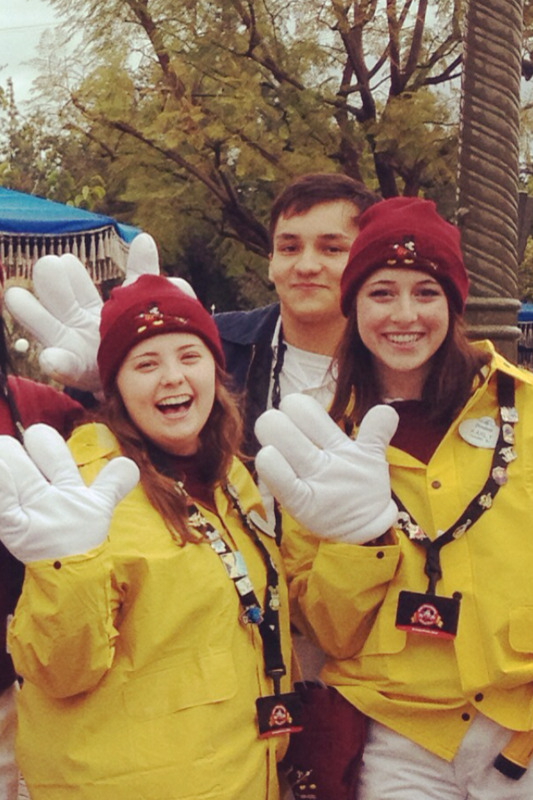 I was a Day Custodian in Disneyland. I mainly worked in Tomorrowland, but just because that was my schedule preference! I would clock in, where I got my location for the day. Usually, your schedule says your location, and either Trash, Sweeping, or Queues. Or it will say restrooms, and you'll find out your location when you arrive. I would then head to my location's locker and check in with my lead, and when my breaks were, or if I needed to go get a radio and keys for a ride. My hours were all over the place! I usually did Tomorrowland Trash, which was my favorite since it goes by very quickly. This was actually my first choice! I was nervous about getting accepted since I had been denied twice. While I'm so happy I got in, I always wonder if I would have gotten in if my first choice was something else. My job was hard, but I was good at it, so I'm still happy I got it! I met a lot of people! Pin trading! There were a lot of pin traders in my location, and I loved talking to them and trading with them. Freedom to explore! I went in so many strange places during work, like under the track of the Haunted Mansion, and in a random break room for Space Mountain, the basement of Star Tours, the parade building, the list goes on and on! As long as I got everything done, I had the freedom to chat with guests, find new areas in my location, etc! Stormtroopers! This is a pretty specific one to me, but I got along really well with the wandering Stormtroopers in Tomorrowland. They would come and check inside my trash can, or bring me over to sweep something and pretend they were forcing me to. One time, they opened the lid to my can and I said "that's not the trash you're looking for." I got a lot of guests to laugh on that one. Maybe we got along because we both wore all-white? Restrooms! I never actually had a restroom shift, but I did have to train. Not a fan. It's so fast paced and you have no freedom. The costumes! I am so envious of people that got to wear fun, themed costumes. And white shorts don't look good on anyone. Guests that assume I don't know the answers to their questions because I'm "just a custodian." 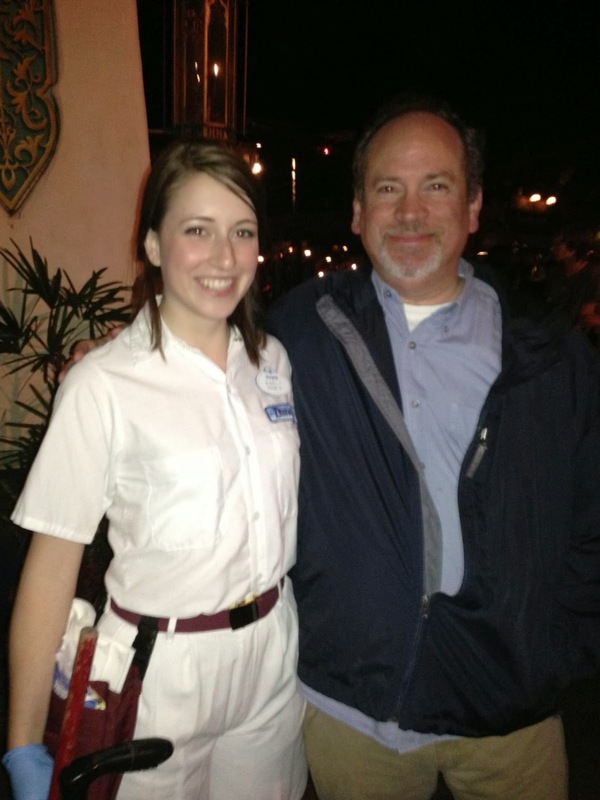 Karlyne and her uncle, who used to be a Disney custodian! About halfway through my program, I was sweeping the Buzz Lightyear Astro Blasters queue when I overheard a family talking about how sad they were that the line for Star Tours was so long. A few moments later, they struck up a conversation with me and I talked to them the whole way through the line as I swept. When they boarded, I quickly walked over to the Star Tours entrance and asked one of the greeters if he would help make a magical moment. After getting the ok, I hurried back over to greet the family at the exit for Buzz, and I took them up the VIP hallway and right on to Star Tours! They could not stop thanking me! I realized that once you’re a cast member, you are the one that makes the parks so magical, and that I wanted to keep making magic for a long time. I was so unsure about what I wanted to study in school, so I knew this would show me what kind of opportunities are available. I assumed I would use the DCP on my resume to look good for other companies, but I realized that my career goals lie within the company! I'm applying for the WDW Fall 2014 program right now! I really wish I had worked out or physically prepared for my role. You're not only on your feet a lot, but you're walking constantly. As for the program in general, I really wish I had prepared for housing more. I didn't pick roommates ahead of time, and I brought way too much stuff. Prepare yourself physically, and wear sunscreen every day! And don't be afraid to ask for help. Make friends with your fellow cast members! While you do work independently mostly, you'll want people to hang out with at the locker. And try every location at least once! If it's the right time in your life, just apply! It's worth putting school on hold. And remember that every role is a starring role! If you think the jobs available won't help with your major, you're wrong! It will help in ways you won't even realize! Good luck to those currently applying, or those thinking about it!